“Why are these people doing this to us in the middle of Shabbat morning services?” asked my 7-year-old daughter and my 10-year-old son as they gave me a flyer that was just handed to them through the gate. Our UT Jewish community was gathered in synagogue, praying the Shabbat morning services. 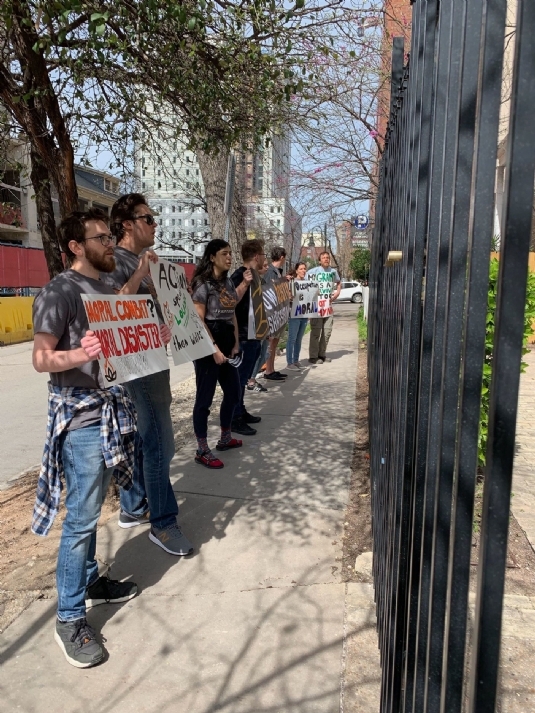 A small group of students and young adults affiliated with “If Not Now” decided it was a good time to protest a guest speaker, who was going to speak at our center later in the day: A sweet and soft-spoken IDF soldier. Shockingly, these protesters spoke to my young children and gave them flyers. They also videotaped and photographed us on Chabad property, something which is traditionally prohibited on Shabbat for religious reasons. All of this didn’t happen during any speech, but during Shabbat morning prayers. I’m not against protests, even if I disagree with the cause. But on Shabbat -- during prayer services -- really? There’s a time and place for protests. It would have been nice to see them show some respect while claiming to advocate dialogue, because there is none without the other. It reminded me of a fringe religious group, who were very active a few years ago, and would find the most inappropriate times to demonstrate. They didn’t make any friends, but cruelly garnered a lot of media attention. 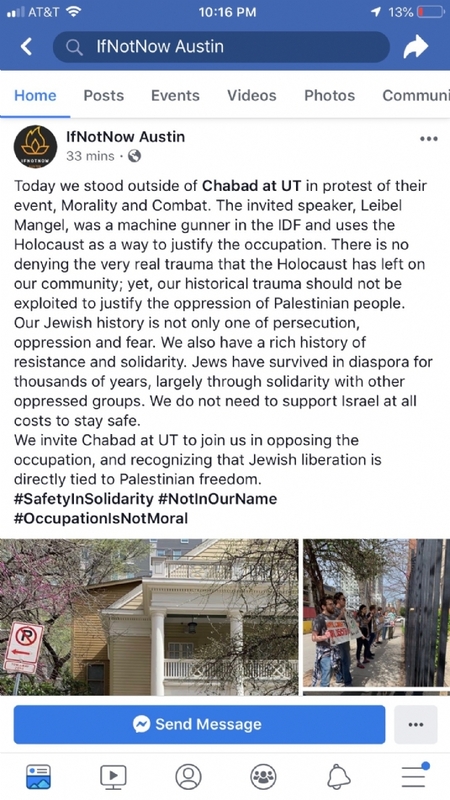 This was a first for us at Chabad at UT. We’re a student center, a Chabad House, a place of Jewish engagement and joy for all Jewish students. Students come to us from all backgrounds and political spectrums. We are not a political organization. We are here for Jews and Judaism, period. As it happens, for security measure we had an off-duty police officer at the Chabad house. She is an African-American police officer who we later found out is a detective and an ordained minister. She joined us and the discussion at the Shabbat meal later in the afternoon. She seemed to be perplexed by the protest in the morning. Our guest, who served in the IDF, spoke without any agenda, sharing his life experiences about ethics in combat, challenges that the police officer seemed to be able to relate to. She told us about her husband who was in the U.S. military and faced similar challenges. She would be on the phone with him hearing bombs exploding overhead and he would tell her that everything was ok. It was a thoughtful and meaningful conversation, again with no politics but plenty of love and mutual respect and thoughts to ponder. He shared a story about his grandfather, who faced death or a lifetime of being paralyzed by the infamous Nazi murderer and torturer in the Holocaust, Josef Mengele. He stood up to him and was miraculously saved. Courage! He visited Auschwitz together with his grandfather, with a beautiful message of hope, which seem to resonate with many students. He was one of the soldiers who found the bodies of the innocent Israeli boys who were murdered by Hamas terrorists. He shared the impact it had on him. He also led an interactive discussion about ethics in combat, with the core point being his personal struggle with saving both innocent life, both Jewish and Arab. It was something that left you thinking. No agenda, no politics. I also spoke, about how in this week’s Torah portion the half shekel was used for the census to count the Israelites in the wilderness, before they entered into the land of Israel more than 3,000 years ago. Teaching us the idea that we are all halves of a whole, and only when we unite can we have completion and peace. The If Not Now group, lied about the what was discussed, and exploited our Jewish community for cheap photos on social media. It’s absolutely unacceptable and unethical that these protesters targeted my children. I, as an adult, truly enjoy good conversation with mutual respect, but for protestors to engage young children is plain wrong. The saddest part to me is that the protest was organized by fellow Jews, who should have understood the value and sensitivities around Shabbat observance, prayer and community. They showed up in the middle of morning Shacharit/Mussaf prayers, and very insensitively took pictures and videos of my kids on Shabbat. They failed to show the most basic respect and sensitivity. It was in certain ways a very sad day. I am hopeful that one day it will be good for all of mankind, both Jew and non-Jew, as we work together to repair the world via our holy Torah. With mutual respect and dialogue, with our combined effort and actions of bringing world peace, redemption, we will reveal G-d in this world. We will make it a fitting dwelling place for him, as it is stated in the Midrash, with the coming of Moshiach, may this be speedily in our days! P.S. A big thank you to the Jewish Community Relations Council of Greater Dallas (JCRC) and Jewish Federation of Greater Dallas for making this beautiful and overall inspiring Shabbat happen and a big thank you to the wonderful students of UT, many of whom are proud Jews and are like family to us. AM YISRAEL CHAI! 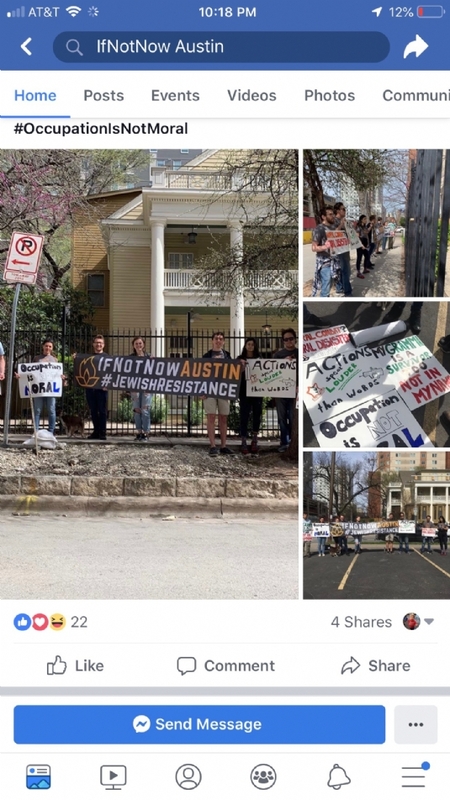 Screen shots taken from IfNot Now Facebook page insensitively taking pictures (and videos of our kids) on Shabbat protesting a non political IDF speaker in our house while we are simply in the middle of morning prayers. The National IfNot Now Facebook page praising their success. Very sad, ignorance, they likely know nothing about Israel, never been there, no nothing of the real history or the term Palestinian. To top it off their ignorance they defile their own holy-day which they likely respect other's holy-days.